Rickey Henderson, Earl Warren, Too $hort, and Gertrude Stein all came out of Oakland, and now it's the turn of this street-parked Jeep FC170 to put the East Bay's main city on the map yet again. If and when I run out of DOTS cars in Alameda, all I'll need to do is take a quick hop across the Estuary and start photographing Oakland vehicles; as you can see, they don't disappoint. Akier spotted this fine example of forward-control awesomeness in the Temescal district and was on this truck with his camera like Alice B. Toklas on a batch of hash brownies. Make the jump to read what Akier has to say about this find. So I was cruising around Oakland (Temescal neighborhood) with my girl, searching high and low for an apartment, when on a side street I caught a glimpse of this beauty out of the corner of my eye. 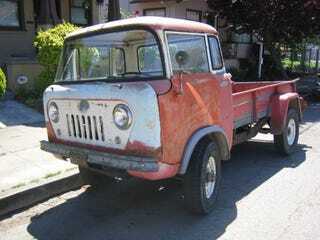 It's a Jeep FC170, and I couldn't narrow down the year anymore than '57-64 because none of the registries I could find had a year-by-year breakdown. This guy looks kind of tired, and I can't tell if it runs or not. But man oh man, is that forward control setup cool. I thought you'd all get a kick out of it. Let me know if you want more pictures of specific info about this one, because I can always swing by and take a look again. BTW, I have a few other DOTS Oakland submissions if you'd like - a Chevy-powered FJ40, a Peugeot 504 diesel wagon, a 50's Chrysler 300, and a B-body Plymouth that has been painted flat-black and equipped with flamethrowers for Burning Man. Let me know if you'd like those. Thanks dudes, keep up the good work.